Ground based positional measurements of 65 of the fragments from disintegrating comet 73P/Schwassmann-Wachmann have been analysed to help identify some of the many small pieces of the comet revealed by a wide angle infra-red image taken by the Spitzer Space Telescope in May 2006. On 10 May 2006 a stunning infra-red image of many of the fragments of Comet 73P/Schwassmann-Wachmann was released by NASA (see original press release 'Spitzer Telescope Sees Trail of Comet Crumbs') represented above in false colour but also available in high resolution black & white format. The image shows the two brightest components B & C together with many of the individual fragments of the comet detected by ground based instruments as just part of an almost continuous line of warm dust left behind by the disintegrating comet. The image was a mosaic of three fields, by the Spitzer MIPS instrument operating at a wavelength of 24 microns, taken over a period of three days from 4th to 6th May 2006, with a total exposure of 21 hours. During the 2006 apparition of the comet a total of 65 fragments (Table 1) were observed from the ground for two or more nights and received official designations. The two main fragments designated B & C had been observed in previous perihelion passages in 1995 and 2000 and were the two brightest components in 2006. Fragments observed for the first time in 2006 were designated G, H, J - N, P - Z, AA - AZ and BA - BS. Many more fragments were reported during 2006 but did not receive designations because of lack of confirming observations. As has been shown here and elsewhere, flaring of individual small fragments by several magnitudes in one or two days or less appears to have been common, so a fragment observed one night was often completely invisible when follow-up observations were attempted on subsequent nights. Figure 1 shows the original high-resolution black & white Spitzer image at reduced scale, with the main component C identified in the top of the three fields, with component B being the brightest of the many fragments visible in the lower half of the image. All the published astrometry for the components in 2005 and 2006 was analysed to determine the perihelion time of each one, so that the smaller components could be identified on the Spitzer image by interpolation between the larger, more easily identified fragments. 8674 astrometric positions were used, 73.5% of those being of the five brightest components C, B (including AQ which split from B during April 2006), G & R. Of the remaining 60 fainter fragments, 40% were observed for less than 10 days. Because some of the minor fragments were observed for just a few days, values of the perihelion time (T) could not be determined accurately via direct orbit determination. Making the assumption that the time of perihelion for the trail of fragments was proportional to their spacing in the sky compared to other nearby fragments, T was determined for all of the poorly observed fragments by interpolation in Right Ascension between well observed components with accurately known values of T. In each case this was done within the observed arc of the minor fragments, assuring relative positional accuracy to a few seconds of arc. Table 2 lists all the designated fragments in order of perihelion time (T). The extreme variability in brightness of the smaller fragments in short timescales means that those observed in March and April 2006 cannot be assumed to be identical to fragments identified in approximately the same location in the Spitzer image. The image is a mosaic collated from exposures made over a period of three days so the separation of the fragments across the entire image will not always be proportional to the perihelion time T.
The Spitzer Space Telescope is positioned in an orbit around the Sun very similar to the Earths orbit, but trailing the Earth by 0.44 AU. 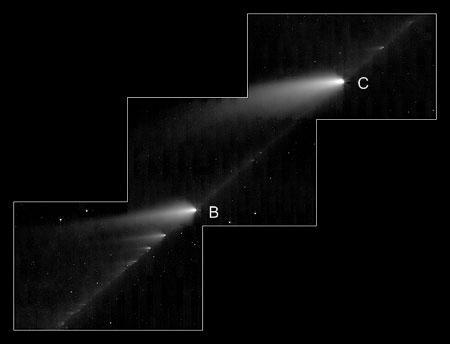 When the images were taken on 2006 May 4 - 6, the comet fragments were only about 0.1 AU from Earth, so the perspective from the Spitzer Space Telescope was appreciably different to that as seen from Earth (Figure 3). Figure 3. The positions of the Earth, Sun, the Spitzer Space Telescope and trail of fragments of Comet 73P/ Schwassmann-Wachmann viewed from north of the Ecliptic on 5 May 2006. 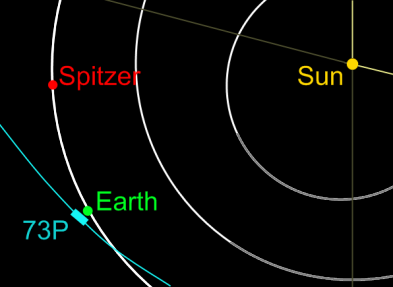 The length of the trail of 73P indicates the extent seen in the Spitzer image. The extent recorded by ground based telescopes was about 60% longer. The orbits of Venus and Mercury are also shown. To minimise some of the distortions introduced by those factors, interpolation has been done separately within each of the three Spitzer frames. Even so, the unambiguous identification of specific fragments, especially in the western half (right hand side) of Figure 6 is not always possible. Below are the three sections of the original Spitzer image, with marks indicating where 53 of the 65 named fragments have been determined to be. Four other named fragments precede the easternmost image and a further nine trail the westernmost image and are therefore not included in the images below. Figure 4. Fragments with perihelion times from June 6.4 - 7.1 UT 2006. Figure 5. Fragments with perihelion times from June 7.2 - 8.0 UT 2006. Note the several obvious fragments that were not designated from ground based observations. Figure 6. Fragments with perihelion times from June 7.9 - 8.8 UT 2006. See the full size image (3621 x 1579 pixels, 621 KB) of all three sections combined. Summary tables of fragments of 73P can be found here. All images on this page are Courtesy NASA/JPL-Caltech/W. Reach (SSC/Caltech) unless otherwise noted. Identification of individual fragments on the images is by Peter Birtwhistle.